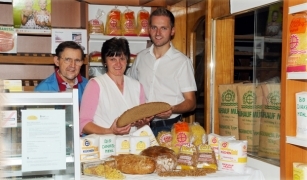 We are a Lavanttaler traditional company, who is producing best quality of bread (rye bread, whole wheat bread, linseed bread, sunflower bread and pumpkin seed bread), various flours (rye, wheat) and pasta (soup, spaghetti , tagliatelle, ...) for more than 80 years. You receive our daily fresh, natural foods from our traditional flour mill and bakery and are supervised directly by the management. In the course of this personal contact, we can give you helpful tips for bread baking! 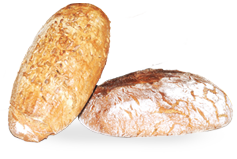 In addition, you can learn more from us about the production of flour and bread. Selling out of business hours by appointment.